Every Friday, with very few exceptions in the last two and a half years, I go to the shuk (farmer’s market) for my weekly produce. You can spot me strolling down HaCarmel with my strawberry print cart, an attractive outfit, and freshly sprayed perfume. Everybody knows, the better you look at the shuk, the more freebies you get!! This Friday, Yossi threw in two batches of green onion and bundle of coriander. Last week, I scored a huge melon, and the week before, I kid you not, he slipped two perfect avocados into my cart. Trust me ladies, it’s worthwhile slapping on a good attitude and that cute little dress when heading towards the market. 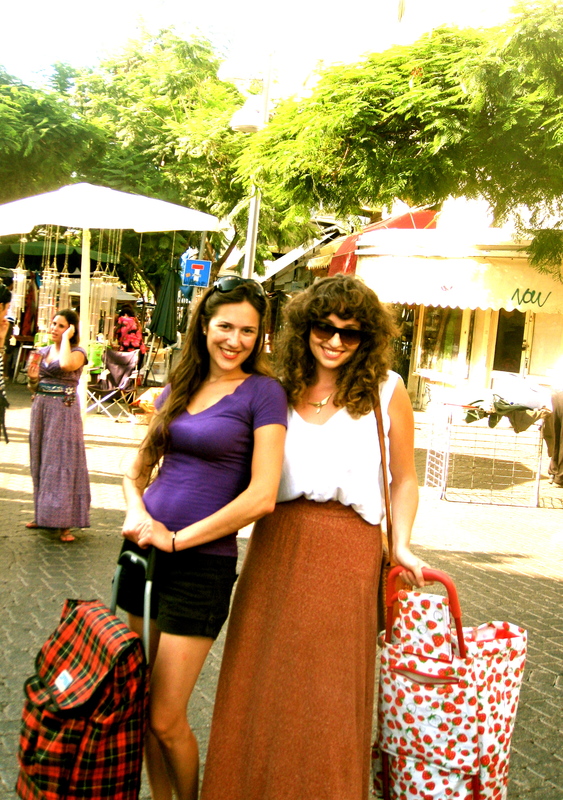 But, flirting at the shuk is not what this entry is about. Actually, it’s about another reputation I have: my salads. They’re amazing. It’s true! Ask my jealous colleagues during lunch. Ask my friends, who I love to feed. They’ll tell you just how beautiful, delicious, and soulful they really are! Granted, it’s easy to be conceded about my cooking in Israel, where I have access to the worlds’ best fruits, vegetables, and dairy – they all make me look good!! The most important ingredient of all is kilos of gratitude for your food and its nourishment, including the free stuff!! This entry was posted in Food, Tel Aviv by beatatude. Bookmark the permalink.